In 1978, while we were building The Loomis Lake house, the world was watching Saturday Night Live (with Steve Martin’s original King Tut performance) and Saturday Night Fever. Gas cost .63 a gallon, and new homes went for $54,800.00. 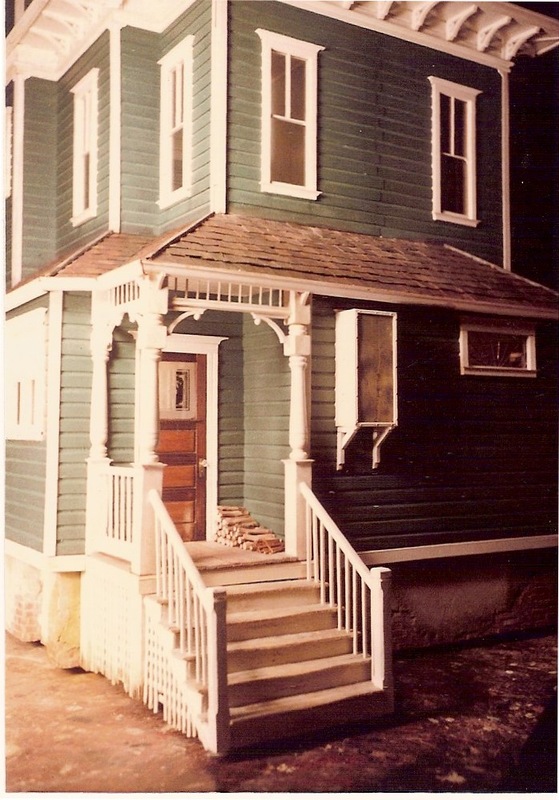 The Loomis, the first of the three houses we completed that year, was a steal at $4000.00. 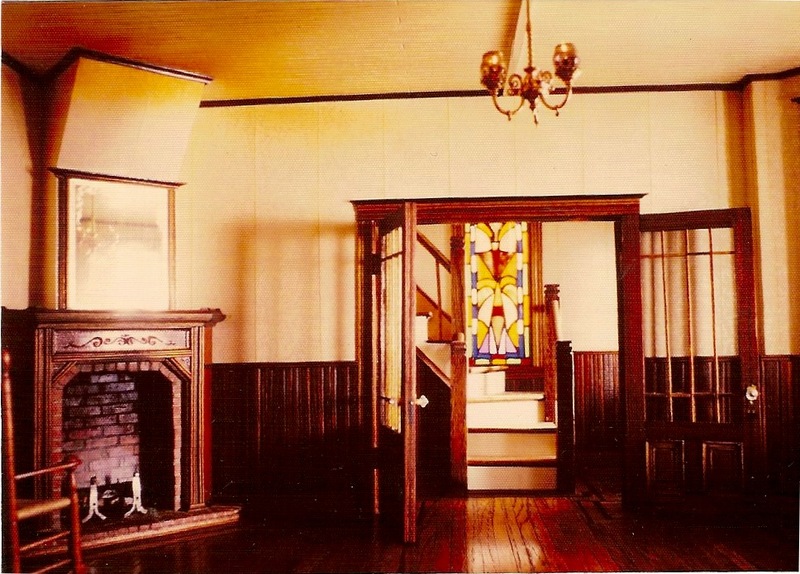 It included one of a small handful of Marie Freidman hand-blown cranberry glass chandeliers, an elaborate stained glass window, and fireplaces upstairs and down. I do remember one sweltering day when we escaped to the beach in bathing suits and flip-flops (highly unusual because our Pacific Ocean water is normally too cold to swim in). It was low-tide and the beach was cratered with huge tidepools, deep and wide enough to lie in, so we ditched our flip flops by a drift log and headed south to see how many tidepools we could swim in. Several hours later we returned to find our flip-flops gone—unimaginable on such a beautiful day, and with so few people around. It didn’t spoil the day,however, just gave us another marker for one of our Most Memorable Days stories. I mean, they were old flip-flops! Using straight-grained fir planks, Noel cut wainscot strips ¼”w by about 24”l on the table saw. I then beveled them on the Dremel scroll saw sanding disk, first the length of one side, then the other (I know, you toolies, we don’t believe in or own a planer…). Phase two was to cut the strips to around 4’ long—a little longer than the intended height of the wainscot—and glue them down on newspaper. To keep my boards vertical. I used a T-square and dark lead pencil to draw guidelines on the paper, then used our old standby Elmer’s white glue to glue them to the paper. Every ten, or so, strips, I used a triangle to make sure they were tightly butted together, and the lines were perpendicular to the bottom edge. I then weighted the wainscoted paper down to dry. Once dry they were sanded, then scribed (or scored), each board with a line down the center to form the “bead.” Our scribing tool was a large galvanized nail tip Noel had sanded the bumps out of, and the T-square. 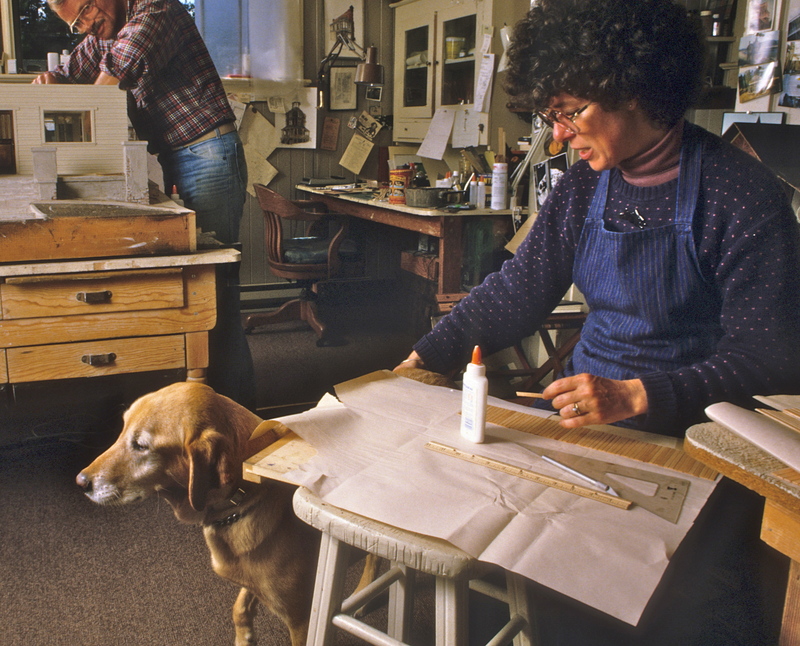 Sometimes I had to go back with an emery board to straighten or deepen some of the scribes. We then hand-sanded down any wild wood fibers, and stained or painted it. This was usually a 2-3 coat process, with sanding in between, and finished with 4/0 steel wool. Once the wood felt smooth, we rubbed in Johnson’s paste wax. Now the sections of boards were ready to be trimmed to the correct height, and glued onto the walls, with, yes, more Elmer’s. 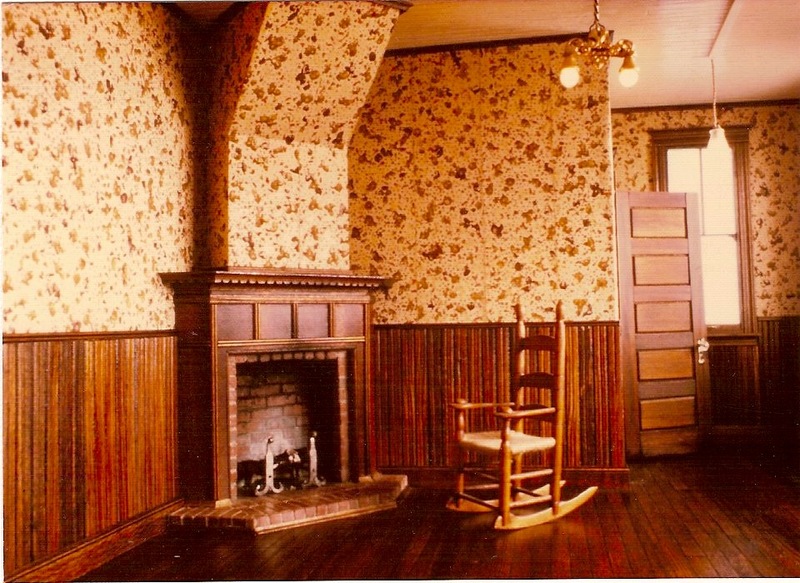 Wainscoting was a job, like all the others–tedious at times, rewarding at others–but overall we hoped to make each element of the house reflect the builder’s hand more than the machine’s. 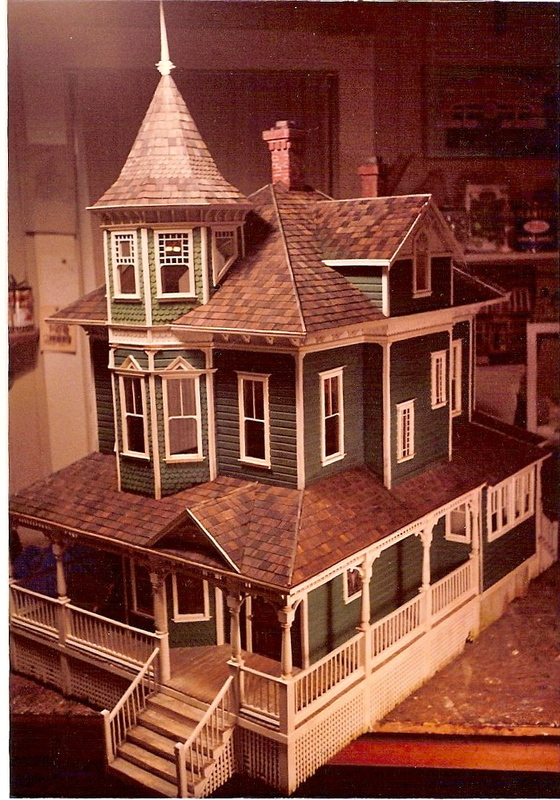 This entry was posted in Bio, Houses, Miniatures and tagged architecture, dollhouses, lifestyle, The Loomis Lake house, Victorian beaded wainscot, work style. Bookmark the permalink. A planer would have made a mess of the straight grained fir, the sander was a better choice. But I am wondering why you did not raise the sander up to a comfortable working height instead of suffering in pain? The easy solutions often elude us. Hello Pat, and …WOW!! I’ve just discovered you and I’m very impressed with your work. My wife and I want to do exactly this when we retire in a few years. You’re a great inspiration to us, if only we’d started earlier like you both did. 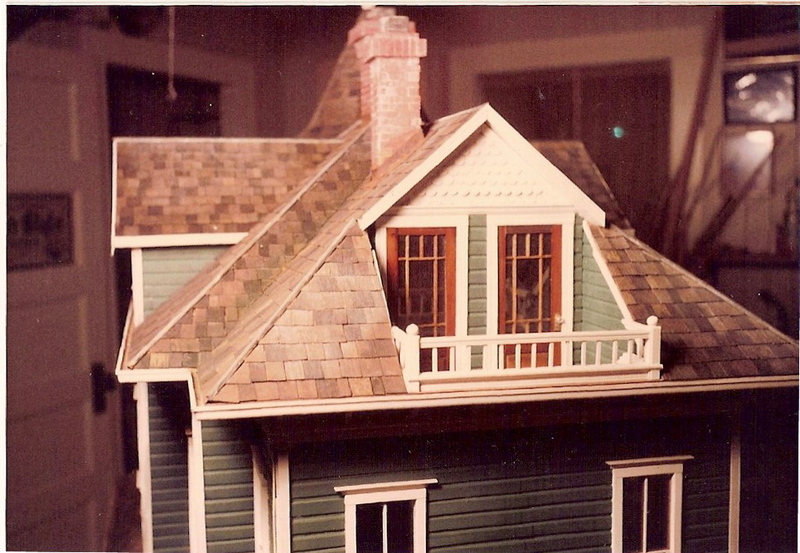 We build custom dollhouses from kits but will start to build them from scratch and seeing some of your work has definitely set the bar. Glad to hear you’re enjoying our work, and that we’re inspiring you!